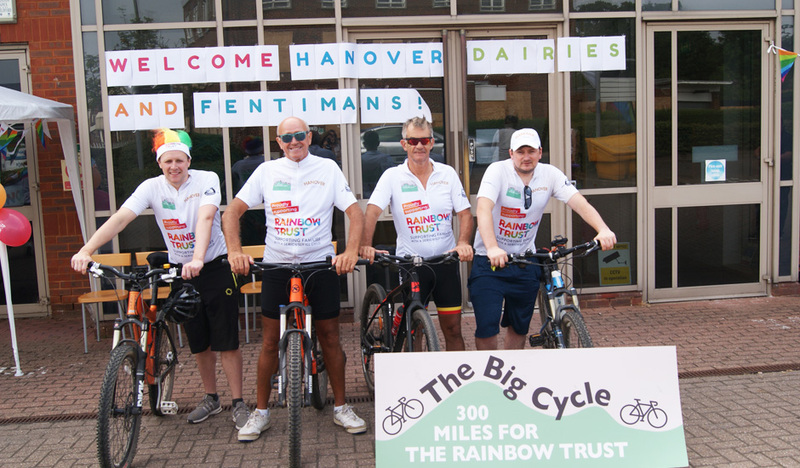 On Thursday 5 July North East drinks giants Hanover Dairies and Fentimans, makers of premium mixers and soft drinks, successfully completed their 300-mile bike ride ‘The Big Cycle’. The epic journey, which took seven days, has so far raised an impressive £43,652, more than double the initial target, for Rainbow Trust. Rainbow Trust Patron Trevor Hanover, owner of Hanover Dairies and fellow cyclists Michael Hanover, Paul Doran and Eldon Robson, owner of Fentimans, finished their journey at Rainbow Trust’s Leatherhead headquarters in Cleeve Road. Rainbow Trust staff cheered the riders into Cleeve Court with bells and pompoms after which they enjoyed a celebratory reception of croissants, pastries and refreshments. The Big Cycle participants took on some of the most challenging terrain in the UK with the route taking them from Kielder Forest to Lake Windemere and on to Preston, Kendal, the Peak District and Forest of Dean before culminating at Rainbow Trust HQ. Trevor took on the challenge after being inspired by families he has met who are supported by Rainbow Trust, such as the Stockills from Sedgefield, County Durham, whose daughter Amy died in February 2016. His fundraising efforts over the last decade have raised around £310,000 for Rainbow Trust and he was thrilled to be able to increase the initial Big Cycle target of £20,000 to £40,000. “I feel great. It’s fantastic to give something back. The ride was tough but we have thoroughly enjoyed it and the thought of the families supported by Rainbow Trust spurred us on. I’m delighted that our punishing training schedule paid off and we all made it unscathed and in one piece. We have been lucky enough to cycle through some of the most beautiful countryside in England and experience some of our finest summer weather too. We have been thrilled with the support from both our customers and the public who have been extremely generous. “We are incredibly grateful that Hanover Dairies and Fentimans feel so passionately about Rainbow Trust and organised this challenging event to help us fund our vital support for families with a seriously ill child. We’re calling on runners for Royal Parks Half Marathon!